On Dec. 23rd, 2009, the St. George Orthodox Military Assoc. (SGOMA) received official recognition and a Hierarchical Blessing from His Grace, Bishop Daniel, of the Ukrainian Orthodox Church of the USA (a member jurisdiction of SCOBA). Bishop Daniel has a very deep interest in the well being of the Orthodox Men & Women serving in the US Armed Services. Bishop Daniel spent several years as a US Army Reserve Orthodox Chaplain until his elevation to the episcopate. Bishop Daniel has assigned Father Gabriel Rochelle, Professor at St. Sophia’s Seminary, as his official representative to SGOMA. Father Gabriel will serve as the Chaplain to SGOMA on behalf of Bishop Daniel. Again, we are a Pan-Orthodox Association and we are always welcoming of the official recognition of any other Orthodox Jurisdiction, and we hope that in time we will be able to receive the full blessing of the Standing Conference of the Canonical Orthodox Bishops in the Americas (SCOBA) as a whole. 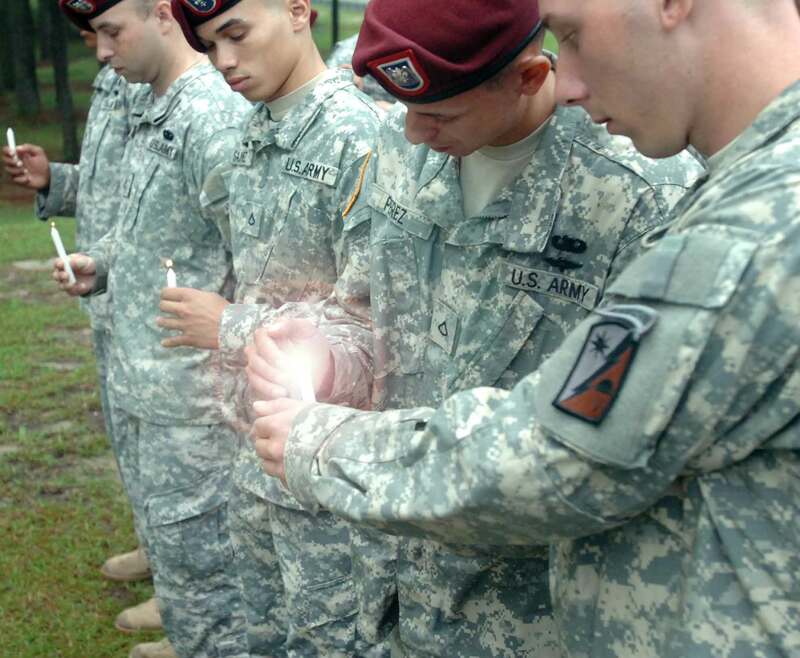 The Association’s goals are to assist these military members in practicing their faith wherever they are. One of the Associations main goals is to work in increasing the size of the Eastern Orthodox Chaplaincy within the US Military. Currently there are fewer than twenty Orthodox Chaplains covering all of the U.S. Armed Services both at home and overseas. Another goal is ensuring that our Orthodox Military Members have access to much needed information (Orthodox Bibles) as well as other various prayers and information. It is estimated that the USA has almost 3 million active and reserve service members in its 5 branches. The standard accepted percentage of Orthodox in the USA is 1 to 1.3%. So the number of Orthodox Christians in military service is estimated around 39,000. With few Orthodox Military Chaplains to serve them, many Orthodox Service Members are going with out religious and pastoral care in the US Military. What can you do? First review our website (www.orthodoxmilitary.org). Find out about the SGOMA and about our Orthodox men & women serving our Country in the Armed Services. Secondly, learn more about how our military is letting the Orthodox Christians fall between the cracks. Third and most importantly, after you learn more about the plight of the Orthodox Christians in our Military, contact your US Congressman and Senators and urge them to do the right thing and increase the number of Orthodox Chaplains (military and civilian contractor) serving our military service members both state side and overseas. Also contact your Priest, Bishop and Metropolitan and tell them to also urge Congress and the Military for more Orthodox Chaplains, as well as to encourage their priests and seminarians to seriously consider a career as a Military Chaplain, or to find was to support Orthodox Military Members in their local areas. The more we stand up for our Orthodox Service Members the better care and attention they will receive! Does St George OMA have an Adopt a Soldier program like Soldier’s Angels? I’m sure many Orthodox faithful (and churches) would participate. Right now the SGOMA has a pen-pal program. As we grow and get more active duty/deployed reservists as members of the Association we would like to develop a program similar to the Adopt a Soldier program like Soldier’s Angeles. Please keep a look out on this Blog site as well as the SGOMA’s website (www.orthodoxmilitary.org) for any news about new programs such as this. It’s a great idea and I am sure our Troops would love it if they had a parish supporting them with letters, icons, books and other needed items. Thanks for your input/suggestion! I am an Orthodox (Greek) Serving in Afghanistan. I knew Chaplain Goetz and pray for his soul. As the chairman for ECMS for Canada and the United States abd former dean of Eastern Catholic military chaplains congratulations, God bless you, and may he prosper the works of your hands and all of your endeavors. I am so thankful to Christ that I stumbled upon this site looking for an old friend. I am going to contact my Texas Congressman and make the needs of my fellow Orthodox Christians known immediately. I’m also going to spread the word to my fellow Orthodox friends and have them do the same. We’ve been our country’s best kept secret for way too long.